The RuffPad is the perfect portable snare drum practice pad for individual drummers and drum corps'. 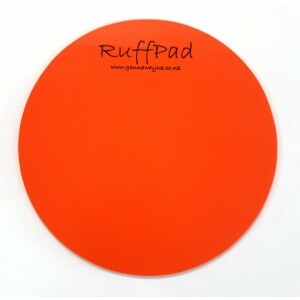 Very responsive, the RuffPad encourages excellent stick control making rudiment and score practice a pleasure. Designed to be played on a table top, the sound off the RuffPad is clearer and crisper than you would expect from a rubber practice pad. QUANTITY DISCOUNTS AVAILABLE!!! Contact us for more information. Add any pair of sticks for just $20*! *Applies to in-stock, ranged sticks only. Select from available options, above.